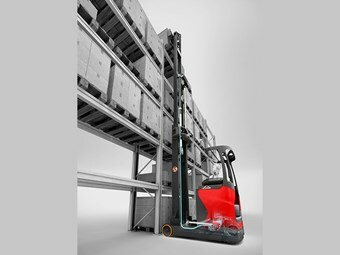 A new reach truck operator-assist system called Dynamic Mast Control has been announced by Linde Material Handling’s head office in Aschaffenburg, Germany. Linde's reach truck operator-assist system, Dynamic Mast Control. The company says the system is currently completing its final field test phase and will be available for the existing reach truck series Linde R14 – R20. "The market trend for ever higher storage racks in warehouses and distribution centres is continuing apace," says Alexander Schmidt, head of reach trucks and tractors at Linde. "This means that there is an increasing demand for reach trucks with lift heights of over eight meters. While only 38 percent of all Linde reach trucks sold in 2005 were designed for such heights, this increased to 52 percent last year." However, higher lift heights place more demands on the skill of the operator. With the mast fully raised, the dynamic mast oscillations produced during reach movements are more pronounced particularly when laden. In addition, with the pallet load fully raised, the forward deflection of the mast increases. "When placing pallet loads onto a rack, the operator must first wait until the dynamic mast oscillations have ceased, because even with small oscillations it is difficult to position the load accurately into the rack location," Linde says in a statement. "This makes the operator’s task much more challenging and in the worst-case scenario, the load could damage the rack or displace the load stored behind. "This eventuality could happen because the bigger the mast deflection, the more likely it is that the pallet load will be placed too deeply into the rack space and the load/pallet faces in the racking will therefore not be uniform along the aisles – the ‘chimney effect’ occurs." This non-uniform positioning of the pallet loads in the racking also makes it more difficult for the operator to retrieve goods efficiently at high lift heights, Linde adds. This is because the deeper the pallet load is placed into the rack the greater the centre of gravity becomes. "When the reach truck approaches a rack position to retrieve such pallet loads, it is not possible for the forks to be positioned completely underneath the pallet on the first approach," it writes. "This means the operator has to bring the pallet forward slightly before lifting it off the rack and this increases the cycle times. 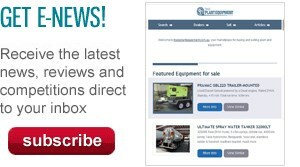 "In addition, there is a possibility that the deflection of the mast while lifting the pallet load from the rack could cause the pallet load to impact with the rack or with the load stored behind, especially if the load behind is also positioned too deeply." The key to the company’s new sensor-controlled Dynamic Mast Control (DMC) operator-assist is a very precise electric linear actuator housed in the reach truck’s motor compartment. Dubbed ‘Linde Electric Reach’, it makes lift and reach movement both smooth and simultaneous by automatically minimising mast oscillations and deflections through counter-movements of the reach carriage. "This means that the operator of a Linde reach truck fitted with DMC does not suffer the waiting times associated with mast oscillations and deflections and can therefore store pallet loads faster, uniformly and more safely," Linde says. "In addition, when retrieving a pallet load from the rack the forks will always be fully inserted into the pallet on the first approach, which results in faster cycle times, and the risk of damaging the rack or the load stored behind is virtually eliminated." Click here to find Linde forklifts for sale. Click here to look up Linde forklift specifications.